An interest in infectious diseases is what prompted Pamela Bailey’s decision to travel to the Caribbean. She thought that coming here would allow her to see a wide range of illnesses and fulfill the necessary requirements for the completion of her medical degree. 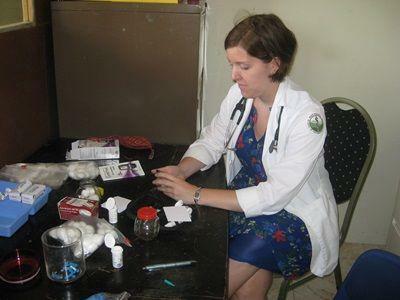 As a result she signed up for the medicine programme with Projects Abroad Jamaica. Once her volunteering tenure ended she would return home for graduation and start a new job. for Jamaican medical students who were doing their clinical rotations. Pamela joined the class and expressed that she benefitted from the experience. Her dedication to the classes was obvious, as she would spend time reading and preparing before the lectures. While Pamela notes that volunteers are not always physically needed at the placement, she thinks that it is important for them to understand differences in healthcare systems so that they can help to bring about changes where needed. For example, she was able to make a difference through her interactions with the patients. She expressed that she was persistent and spent time explaining the procedures to the patients, and for this many were grateful. In addition to working at the hospital, Pamela participated in two monthly medical outreach activities led by Projects Abroad Jamaica. The first was held at the Villa Road Primary School, where the children were given lessons on dental hygiene. The second was held in New Green, Manchester where presentations which focused on healthy lifestyle habits for senior citizens were given. While she gained nothing new medically, the experience allowed her to gain a greater appreciation for what she does back home and the medical procedures which are carried out in the US. In Jamaica there are vast differences in the procedures and methods of treatment. For example, in the United States several tests are carried out on patients prior to treatment in order to ensure that the medication or advice given to the patient is precise. She expressed that she had a wonderful time in Jamaica. A few of her most memorable experiences include being exposed to two diseases which she had never seen before during her medical experience, learning how to make fried and boiled dumplings and sitting on the beach in Negril, daiquiri in hand, watching the sunset. Pamela admired the fact that the old volunteers were very welcoming of the new volunteers and her advice to prospective volunteers is that they should “embrace the route taxi system, accept the compliments on the streets and enjoy the island, especially the food, as much as you can”.